I came across many PTCs nowadays which consumes less of our time and worth some extra money each. I filtered out some of the best with some good reputation, design and unique script. I hope these will pay as they are in initial stage of the launch. As I have said in my previous posts, new PTCs will pay initially to maintain their reputation in the industry. Below are the new ones I have joined recently. I am not going to put any links or banners as it is against google policy, so just know about the programs and comment on it if you have any clarifications. 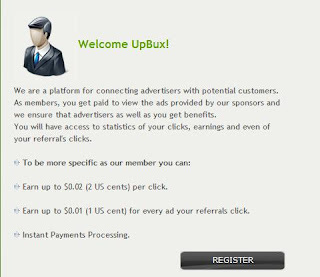 UpBux is officially launched in 05-10-2009. 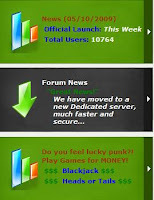 New ways to make money by playing - blackjack and heads and tails. Each ad worth $0.01 for standard members. Payment is instant through paypal and alertpay. Hope we can enjoy the initial stage and make the most of now. It it lasts longer, it will our luck to earn more like Neo or palmbux. The amount of members in a short period of time is the success of this PTC. Hope all of them get paid. The next one I have joined recently is Chillcash. It is also a new launched PTC with a cool degisn with instant payments. Launched in 23-09-2009 and still now going good. 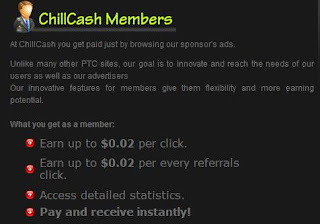 Total members is less but we have 5 ads daily and we can earn pretty good in this. We can try this out as this still in the initial stage. Always 'first in first out' is the motto to remember while joining PTC or any other HYIP (High yielding investment program). Nowadays HYIP even suits PTC as HYIP is investing money and PTC is investing time. I hope these two sites will stand to some extent if we join today. See you with a next brand new post with lots of updates in earning money from legit sites. 3 comments to "Brand New Unique PTCs to join:"
Thanks. I am presume these are legit. I am always open to new PTC sites although I am almost ready to give up on them due to scams. I will take a look at the ones in your list. i think that PTC sites are not good for those who wants to earn more money in less time. i am not a member of any of these sites but after reading this i will join it.